More than 40 West Windsor residents of all ages walked up a narrow stretch of Cranbury Road during the afternoon of Friday, June 28, calling for sidewalks from Millstone Road to Princeton-Hightstown Road (County Road 571). Cranbury Road is a heavily traveled road that lacks a proper shoulder – often a shoulder of any sort. Yet the right of way for the roadway is at least 33 feet – leaving 11 feet or more for sidewalks without the taking of any private property. The West Windsor Bicycle and Pedestrian Alliance supports community efforts to implement a complete, family friendly, commuter friendly street for this important travel corridor in our community. Residents have been asking for sidewalks for at least 20 years and told local officials they want to be able to walk safely to downtown Princeton Junction and to the train station as well as to let their kids visit neighbors. They also called for better enforcement of the 25 mph speed limit, and several immediately volunteered their driveways when the mayor said the police would need a place to park. The group walked from 109 Cranbury past Stobbe Lane, over Bear Brook and toward Sunnydale, stopping at the home of a mother and son who are in wheelchairs. There, the mayor made comments and took questions from residents. Mayor Hsueh said a grant application from the township last year to study a possible project was rejected by the state and that the county doesn’t have money either. He promised that if the state can’t provide funds, he would look at what the township could budget and approach the county for help. He also promised residents that he would arrange a group meeting with the township engineer to explain the township’s idea for the roadway, speak to the police chief about enforcement and to give residents regular updates. Councilwoman Geevers urged residents to remain organized. Do you walk, bike or drive along Cranbury Road? Do you want safe streets for families, commuters, the elderly, and all other road users in West Windsor? Do you want your lawmakers to know that you support sidewalks on Cranbury Rd? Consider attending the West Windsor Township council meeting with other community members this Monday, July 22nd so representatives as well as members of the community can hear about these concerns. Public comment is available for those who wish to speak. Hope to see many community members continuing to advocate for a safer Cranbury Rd for all users. 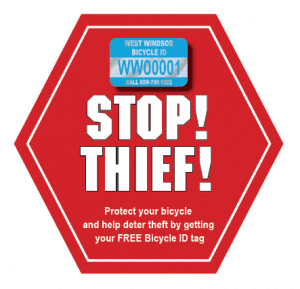 WWBPA advocates for safer streets for all users: pedestrians, bicyclists and drivers alike. A critical need in our community is to improve safety and accessibility on Cranbury Road, a major connection between the train station and points west. Current infrastructure does not protect the most vulnerable users – pedestrians – who have no designated place on the road. A sidewalk, multi-use trail or pedestrian friendly shoulder would improve safety for those who must walk or choose to walk even given current unsafe conditions. Safer conditions would also encourage and allow more people to commute and travel without a car to our major transportation hub, especially those with special needs such as older adults and families. WWBPA supports the Cranbury Road neighborhood in their efforts to create a safer Cranbury Road for everyone. Please join in on June 28th (see info below) and show your support to have a sidewalk/multi-use trail or pedestrian-friendly shoulder lanes installed on the Cranbury Road from Route 571 to Millstone Road making Cranbury Rd accessible for all residents. “As a group of West Windsor residents living on or near Cranbury Road, we invite you to join us for a walk along our street, north of Princeton-Hightstown Road, on Friday, June 28. Or try to. We live in a beautiful area but, unfortunately, there are no sidewalks, nor even a shoulder. We–and our children–face the danger of speeding cars as we walk to see our neighbors next door or to nearby stores. A stroll to the Princeton Junction train station or our local restaurants can become a perilous adventure. Slowing traffic is important, but we are also asking our local and county officials to install a sidewalk/multi-use trail or pedestrian-friendly shoulder lanes on the road from Route 571 to Millstone Road. Cranbury Road has an unused right-of-way along this stretch, so this could be done without compromising any private property. We invite all to join us at 109 Cranbury Road at 4 p.m. on Friday, June 28 as we walk along Cranbury Road to demonstrate the need for a safe route for us, our kids and the motorists and bicyclists who travel it daily. Mayor Shing-Fu Hsueh will join us. 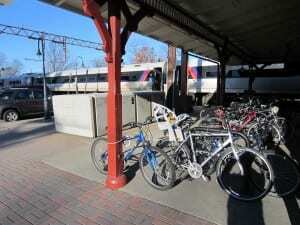 New Jersey Transit is allowing cyclists to get on and off at low-level train stations (think Jersey Avenue, not Princeton Junction) but is adding restrictions on bikes on any train during weekend mornings and evenings. Beginning July 1, bikes no longer will be allowed on trains going into Manhattan from 9 a.m. to noon and outbound from 5 p.m. to 8 p.m. on both Saturdays and Sundays. There is no distinction made between those going from, say, Princeton Junction to New Brunswick and those going all the way into Manhattan. Nor was it clear how many people are bringing bikes on trains and why the restrictions were needed. If you agree with us that the new rules are a bad idea, you can tell New Jersey Transit in the comment section of their quarterly customer satisfaction survey (the latest survey is available through June 28), their online feedback form OR you can speak with leaders directly TODAY (June 20) between 4:30p.m. and 6:30 p.m. at the Seventh Avenue Concourse at Penn Station. The WWBPA is partnering with New Jersey Transit, West Windsor Township, West Windsor Parking Authority, West Windsor BikeFest and the Greater Mercer Transportation Management Association to add bike lockers to the Princeton Junction train station. The lockers, which were unused at the Maplewood train station, were recently disassembled and brought to storage by township employees, and will be reassembled when the concrete pad is poured on the New York-bound side of the tracks at Princeton Junction station. Thanks to all our partners for helping to make this happen! 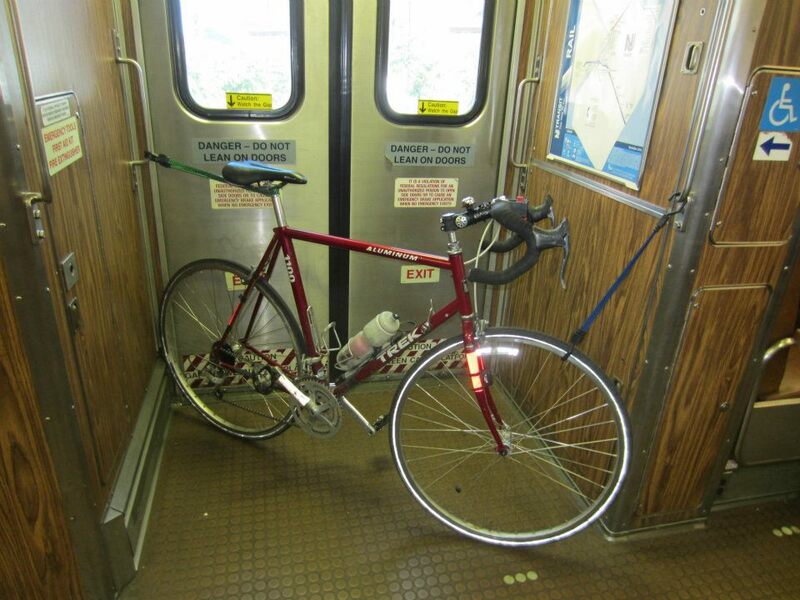 Please join us in encouraging New Jersey Transit to allow bikes to board from all train stations, even those with low platforms, during off-peak hours. This policy, in place since 1998, was recently revised to ban boarding from low platform stations. You can send a quick online letter by clicking here. NJ Transit is now restricting bicycle access to all of its stations that do not have a high-level platform, including the key Hoboken Terminal. That ends up putting nearly half of NJ Transit’s 163 commuter rail train stations out of reach for cyclists looking to take their bikes (thankfully not the Princeton Junction station). This new policy also does not make a distinction between full-sized, standard-frame bicycles and folding bikes. While other transit agencies are spending hundreds of thousands of dollars to greatly expand bicycle access to their trains, New Jersey Transit has quietly changed its policy regarding bicycles on trains that will severely limit those wishing to take their bicycles with them on their next trip, our friends at WalkBikeJersey report. NJ Transit is now restricting bicycle access to all of its stations that do not have a high-level platform, including the key Hoboken Terminal. That ends up putting nearly half of NJ Transit’s 163 commuter rail train stations out of reach for cyclists looking to take their bikes. This new policy also does not make a distinction between full-sized, standard-frame bicycles and folding bikes. Read the full report here.